The Italian knows that his Yamaha did not show his best light in rainy conditions this season. He, therefore, hopes to pass between the drops in Japan. The three weeks of rest between the Grand Prix of Aragón and Japan have undoubtedly done the greatest good to Valentino Rossi, who was able to complete his convalescence following his double fracture tibia-fibula occurred on 31 August. It was much more physically challenging, after a final round, which he used especially to avoid losing the pace and accelerate, as he was able to declare at the press conference, his recovery - which in no way prevented him from signing a brilliant third time in qualifying and a courageous fifth place in the race - the Doctor approaches the Japanese sleeve of the calendar with a smile. On a circuit that suits him well, even if his last victory on the Twin Ring goes back to 2008, the Yamaha driver hopes to create surprise, as he had done last year by slamming pole position ( its last to date). But the exercise on Saturday, the Italian is not afraid, and the latter prefers to turn to what can have a concrete impact on the championship, namely the race. Yet, if there is one area where the problem is, it's Sunday, when the official Yamaha has difficulty maintaining a correct rhythm over the whole distance. "We must try to work to progress especially at the end of the race, where we seem in difficulty," acknowledges the number 46, which does not veil face the difficulties of the mark with the three tuning forks to spare the rear gum , whose premature and pronounced wear is at the origin of this lack of pace. And if the title is no longer a realistic goal - although still mathematically within reach - Rossi intends to take advantage of the latest deadlines of the year to advance his machine in this field. "It is very important to work now for next year, unfortunately, it will take time to settle this," he said. "We saw that we could progress on certain aspects, which could be the electronics but also the chassis or in any case the distribution of the masses." At Yamaha, therefore, there are already some avenues of improvement in view of 2018. However, the problem of the strong degradation of the rear tire should not be dominant this weekend, on a braking acceleration-braking circuit that does not stress tires. "In my opinion, of the three tracks [overseas], it is here that the rear tire on the paper should suffer the least because there are no particularly stressful turns and generally the grip of this track helps But as we have seen this year, we have to take the track and then we will see. " The rain expected this weekend should nevertheless blur Yamaha's work on the behaviour of its tires in "normal" conditions. A parameter all the more regrettable for Rossi that this one is rather at ease on the Twin Ring on a dry track. "It would be a shame because last year I was very fast in the dry - even though I was unfortunately falling - while in the rain I am a little more worried," he said. "This year I was not particularly fast in the wet, but it will also be a good way to try to improve the bike because last year we were very strong on the wet so we do not understand. " It is true that the M1 has witnessed a worrying lack of speed on the wet this year. And even more so when conditions are mixed, with a limited water level on the tarmac, as was the case on the first day of testing in Aragón, Maverick Viñales and Rossi had completed the 17th and 20th positions respectively. combined time. 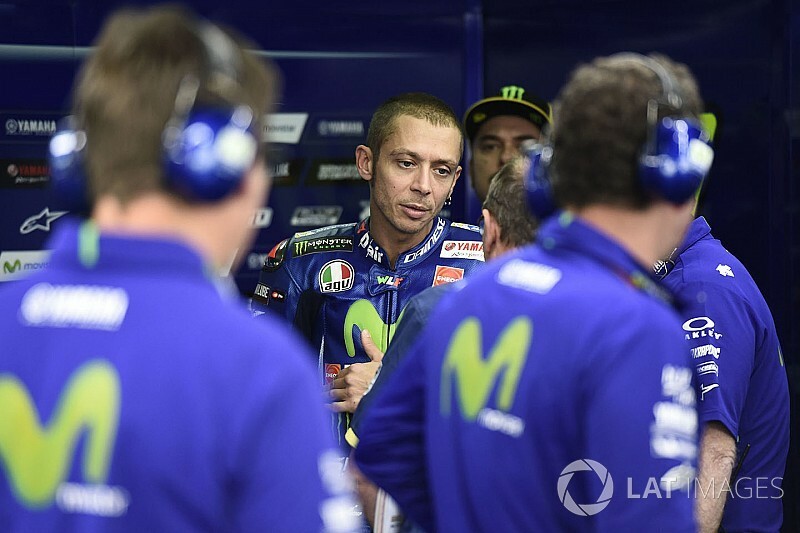 "After a few laps, the rear tire starts to lose a lot of grips," Rossi said. "For me, if it's full wet it's not too bad, but if there's not a lot of water we're in trouble." The Italian knows that his Yamaha did not show his best light in rainy conditions this season. He therefore hopes to pass between the drops in Japan.